BJP is leading in Karnataka elections. This once again proves that prime minister Narendra Modi’s popularity is intact, despite many signals and arguments to the contrary. Karnataka is one of the few places where the Congress has deep roots and thus provided a good opportunity to its new president, Rahul Gandhi, to prove his mettle. He has, however, failed to match Modi here. Karnataka was not an easy win for Modi, as it is not only a state where the Congress has substantial resonance but also because the BJP’s prior term with BS Yeddyurappa as chief minister was mired in controversies. The BJP victory here is overwhelmingly a mandate only for Modi. This should mean that his second term at the centre is nearly confirmed, though three major states – Madhya Pradesh, Chhattisgarh and Rajasthan – will go to polls before the Lok Sabha elections scheduled exactly a year from now. Of course, a year is a long time in politics, but will it be a cakewalk for Modi next year? On second thoughts, his position is not as strong as it would seem from a string of assembly victories. 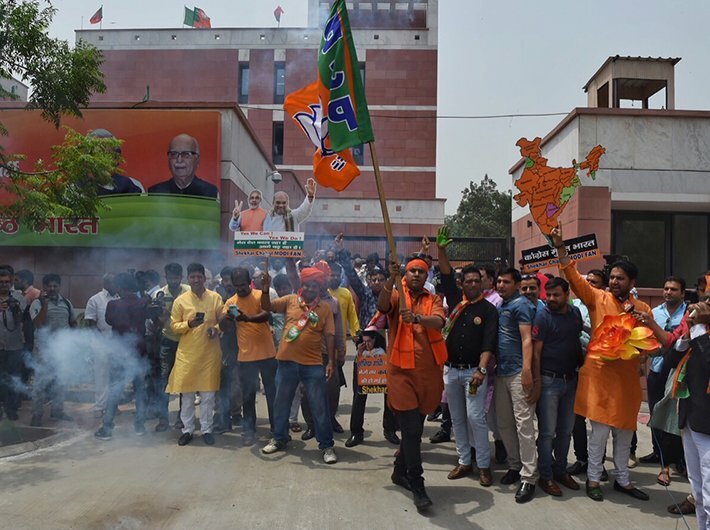 These victories – in Haryana, Maharashtra, Uttar Pradesh, Gujarat, Himachal Pradesh, Uttarakhand, Jammu and Kashmir, Assam, Tripura – can be seen as an anti-incumbency vote. True, Modi has expanded the BJP’s presence into those states where it was never in power. It shows the people of Assam and Tripura were tired of the same old Congress/CPM and wanted to give a chance to a seemingly action-oriented party. In Haryana, Maharashtra and Uttar Pradesh, it was the usual revolving-door – though the historic mandate in the largest state of course stands out as credible performance. That brings us to the losses: Delhi, Bihar, Punjab, Kerala, Tamil Nadu and West Bengal (not to mention the states like Goa and Manipur where the party’s performance was poor though it managed to be in power with alliances). For a party that came to power at the centre with a stunning majority, wins are on par and these losses are noteworthy. Explanations may be different from state to state, but a pattern to them is that whenever a local force other than the long-term status-quoist party (mostly Congress but also CPM) challenges Modi, he does not seem as invincible as he otherwise does. That’s what happened in Delhi and Bihar, and that’s what didn’t happen in Gujarat and similar cases. Also where the regional parties are on a strong wicket, the BJP remains helpless. Moreover, voting in the state elections and voting in the national elections are different. That is why the BJP has lost all but six of the 23 by-elections to the Lok Sabha since 2014, despite the victory march at the state level. It has lost all six this year (including in UP and Rajasthan) and all five last year. The last by-poll it won was in 2016, around the mid-way mark of the centre’s term. That brings us to the two key states going to polls before the general elections. The BJP, it seems, is in a weak position in Rajasthan, and in MP it will face an uphill task fighting anti-incumbency. Party president Amit Shah has crafted a new strategy of fighting elections with micro-planning and use of data. He can be expected to make an all-out effort not to lose just before the general elections those two states where the BJP has a long history. Yet, 2019 will not be a cakewalk. The final-year fatigue, faced by many popular governments in the past, is setting in. Economy woes are only adding to it. If Modi finally manages to win comfortably, at least half the credit will have to go the opposition.